Bed Throws & Runners bespoke made to fit Emperor 6'6" & 7ft beds. The Emperor bed usually measures 6'6" x 6'6" or 7' x 7' but can vary slightly. 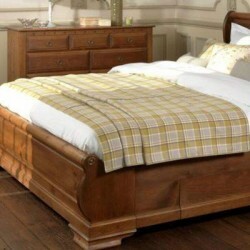 Whilst it is a popular size it is usually only available in specialist bed shops and bed manufacturers. Victoria Linen bespoke make any type of bedspread for emperor size beds. From bed runners to bed throws, fitted or quilted bedspreads, we can bespoke make whatever bedspread you need. We create bedspreads from our selection of jacquard's, chenille's, suede's and velvet's that are the perfect compliment to your emperor bed. Browse a selection of our bedspreads below. If you can't find what you need contact us, we can discuss your needs and have samples ready to send to find the prefect bedspread for your bed. Call us now on 01706 220020 or send us an email. We'll be happy to help. Odyssey Quilted Bed Throw - available in 12 coloursLuxury Quilted Bed Runner or Bed Throw for Empero..
Eclipse Bed Runner Luxury Bed Runner made in a wide range of bed sizes.Made in house at Victori..
Emperor Bed Runner in Opulence GrapeBedspread for 6'6" and 7' Emperor beds.Colour: GrapeSize: 2..
Alissia ThrowLuxury Bed Runner for Emperor & Large Emperor Beds.Made in house at Victoria Linen ..
Emperor Bedspread in AugustusModern patterned bedspread to fit 6'6" and 7ft Emperor bedsAdd matching..
Emperor Bedspread in Crush Velvet - 6 ColoursCrush velvet bedding to fit 6'6" and 7' Emperor beds.A ..
Emperor Bed Runner in FairmontBed Runner made to fit an Emperor 7ft Bed. Available with matchi..
Emperor Bedspread in Orla Kiely Stem Luxury Bed Runner for Emperor & Large Emperor Beds.Mad..
Emperor Bedspread in Wordsworth - 6 ColoursStriped bedspread to fit 6'6" and 7ft Emperor bedsAdd mat..
Emperor Bedspread in Zanzibar AzureBedspread in a modern fabric to fit 6'6" and 7ft Emperor bedsAdd ..
Emperor Bedspread in Zanzibar LatteBedspread in a modern fabric to fit 6'6" and 7ft Emperor bedsAdd ..
Emperor Bedspread in Zanzibar PebbleBedspread in a modern fabric to fit 6'6" and 7ft Emperor bedsAdd..
Emperor Bedspread in Zanzibar RaspberryBedspread in a modern fabric to fit 6'6" and 7ft Emperor beds..
Ridge Sky Bed Runner Luxury Bed Runner made in a wide range of bed sizes.Made in house at Victo..
Emperor Bed Runner in Bowland CheckBedspread to fit 6ft 6in and 7ft Emperor BedsUK Made in modern ch..
Genevieve ThrowLuxury Bed Runner for Emperor & Large Emperor Beds.Made in house at Victoria Line..